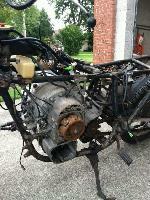 Honda Z50K1 1969 redbug2 Pottstown, PA 0000-00-00 Runs well, smokes a lot, tank needs some work. yamaha YR2 1968 cyclelist Ohio 2012-02-08 1968 Yamaha YR2. All original with the exception of tank repaint. (damage in shipping-thanks UPS) 3600 miles. Excellent overall condition. Yamaha YL1E 1967 redbug2 Pottstown, PA 0000-00-00 Nice Bike, Needs a little bit of work. Yamaha XS2 1972 redbug2 2011-07-27 My High School Bike, no longer with me. Yamaha XS2 1972 redbug2 2011-07-25 Purchased at Mid Ohio Swap, great Condition. Yamaha XS1b 1971 CPkid 2012-09-19 A real fixer upper. Very rusty. Honda XR80 1979 redbug2 Pottstown PA 0000-00-00 Has XL75 Engine, For sale. Honda XR20082 1982 redbug2 PA 0000-00-00 Bought this bike when I was in college. Let my wife use it 20 years ago. Still in great shape. Honda XL125KO 1974 redbug2 Pottstown, PA 0000-00-00 This has been sitting a long time, runs good, smokes. Honda xl 125 1976 amorw Belgium 2012-07-07 Seems to be the oldest reg? Honda ST90KO 1973 redbug2 PA 0000-00-00 Bought this bike at Mid Ohio Swap meet, its in good to great condition. Suzuki RE-5A 1976 redbug2 Pottstown, PA 2013-09-06 Picked up in OH from a pawn shop. Just under 7000 miles when I got it. Not much rust. 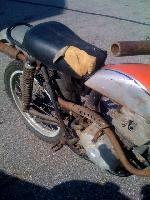 Yamaha RD200C 1976 redbug2 PA 2012-03-15 Runs good. BMW R27 1964 cyclelist Ohio 2012-02-08 Restoration finished in 2011. Mechanics and assembly by Richard Sheckler. Paint by Sterling coach. Non-standard paint scheme from antique Harley-Davidson. Yamaha MX125A 1974 redbug2 Pottstown PA 0000-00-00 SOLD: Ugly bike, painted green by previous owner... Runs, needs some work. Honda MR175 1976 redbug2 Pottstown PA 0000-00-00 In very good shape, 900 Miles on it. Honda EZ90 1990 redbug2 Pottstown, PA 0000-00-00 Picked this up, was totally neglected.... Running now, has carb issues... Neat bike. Yamaha DT50 redbug2 Pottstown, PA 2011-06-21 Picked this one up locally. Runs great. Repaired all of the bugs, lots of fun to dirve. Yamaha DT50 redbug2 Pottstown, PA 2011-06-21 One of two DT50 Parts bikes that I will combine to make another DT50. Honda CX500 Deluxe 1980 cyclelist Pottstown, PA 0000-00-00 Bought this and never did anything with it. Looking to sell it. Honda CT70K1 1972 redbug2 Pottstown, PA 0000-00-00 Functional Restoration. Had this since I was 18 cant part with it. Honda CT70H 1972 redbug2 Pottstown, PA 0000-00-00 Created this bike out of a bunch of extra parts. 4 speed, runs ok. Not sure what I will do with it. 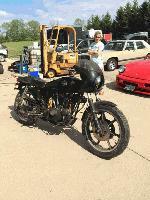 Picked up bike at Mid Ohio Swap meet. Honda CT125 1977 redbug2 2017-08-15 Great bike. Yamaha CR80 1984 redbug2 Pottstown, PA 0000-00-00 Almost junk, but most of it is there, missing cables and seat. Has an extra engine. Listing it in the Classified area. Honda CL175 1972 redbug2 Pottstown, PA 0000-00-00 I may just get this one going. Honda CL100K2 1972 redbug2 Pottstown, PA 0000-00-00 Running good with title, my pit bike. Got this at a local antique motorcycle swap meet. Honda CB160 1965 redbug2 2012-04-17 As purchased, probably will just use for parts. Yamaha BW80 redbug2 2011-09-17 Another parts bike that I may get going. Yamaha BW80 1986 redbug2 PA 2010-09-29 Picked up on ebay, New top end installed, runs great.